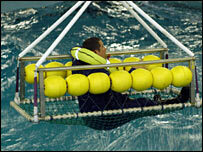 A safety cage designed to recover fishermen who fall overboard at sea has won a major award. Retired skipper Robert Reid, from Peterhead, Aberdeenshire, hopes his design will save lives as it allows those in the water to swim into it. He designed the cage with the help of industry body Seafish and a local company. The man overboard recovery cage has been awarded the safety at sea award at the Seatrade Awards. It was developed in response to a need in the catching sector for an effective man overboard recovery system on fishing boats. Mr Reid came up with the idea of a floating cage that a person simply had to swim into to be rescued. If the casualty is unconscious it is big enough to hold a second person to aid the rescue. Wave tank tests were conducted and the design evolved into an aluminium structure with side floats and netting. Mr Reid said: "It folds compactly for storage, can be deployed within 20 seconds and is big enough to contain two people - enabling a rescuer to be lowered to assist an unconscious casualty. "Thanks must go to Seafish who helped turn my idea into a reality and who have contributed to the cage becoming so successful. "I am delighted to win this award." Alan Dean, mechanical engineer for Seafish, said: "Seafish is pleased to have been able to work with Robert Reid to turn his concept into a reality. "The Safety at Sea Award helps to demonstrate the level of commitment Seafish has to safety at sea. It is also an excellent example of Seafish working with different sectors to achieve what the industry needs." The man over board recovery cage is being manufactured by North East Fabricators Ltd, based at Boyndie near Banff.